Hotel Shambhala,Leh Ladakh, Jammu and Kashmir,India - 194101, Ladakh. It is situated in downtown Lhasa near the Barkhore Bazaar, Jokhang Temple and the Potala Palace. It is the perfect place for seeing all the major attractions. The surroundings are so peaceful and calm that its gives new meaning to the word �sound of silence." It has 83 different guestrooms that includes deluxe suites, Tibetan suites, standard rooms and single rooms. It is about 10km away from the Railway Station and 70km away from the Lhasa Airport. Entertainment include Sauna and Night Club. The shop and beauty saloon are worthwhile for a visit. The Tibetan style conference room & the luxurious conference room are convenient for business negotiation and conferences. 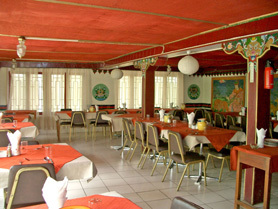 The hotel is two kilometers away from the Airport and one and a half kilometer from town. All rooms have attached bath, with running hot and cold water. The hotel is open from 1st May to October end. Cancellation notice required for group: 30 days.